The next series of posts will look at a few of the scripts I have used. My default setting is the Bridge Illustration. 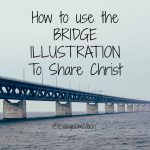 The Bridge Illustration is the one that I use the most often. When I was a youth pastor, reviewed with my teenagers at least once every three months. No one left our youth group without knowing this script inside and out. I use it in all my seminars on personal evangelism.